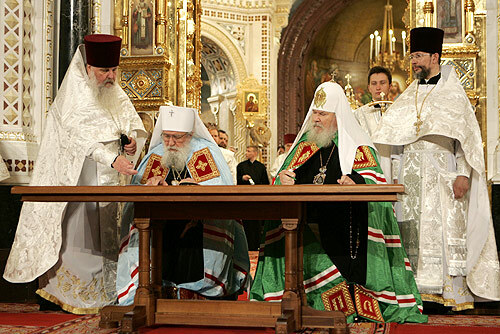 March 17, 2012, marks the fifth anniversary of the signing of the Act of Canonical Communion by His Holiness, the late Patriarch Alexy II of Moscow and All Russia (+2008), and His Eminence, the late Metropolitan Laurus of Eastern America and New York, First Hierarch of the Russian Orthodox Church Outside of Russia (+2008). While many of our readers are likely familiar with how the events leading up to and following this historic reunification have been perceived outside of Russia, few likely have a clear idea of how they have been perceived within the Church in Russia. We therefore offer the following reflections of Archpriest Nikolai Balashov, Deputy Chairman of the Department of External Relations of the Russian Orthodox Church, who served as secretary of the Moscow Patriarchate’s Commission on Dialogue with the Russian Orthodox Church Outside of Russia. In what follows, Fr. Nikolai responds to the question of how the work of the joint Commissions prepared the way for the restoration of canonical unity between the two parts of the Russian Orthodox Church. Archbishop Mark of Berlin, Germany, and Great Britain was Chairman of the Russian Orthodox Church Outside of Russia’s Commission on Dialogue with the Moscow Patriarchate. As such, his approach largely determined the process of reunification on their side. 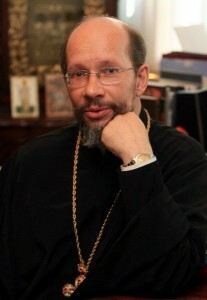 Archbishop Innokenty of Korsun (now of Vilnius and Lithuania) was Chairman of the Moscow Patriarchate’s Commission for Dialogue with the Russian Orthodox Church Outside of Russia. Archpriest Alexander Lebedeff, Rector of Holy Transfiguration Cathedral in Los Angeles, was secretary on the side of the Russian Orthodox Church Outside of Russia; and I was secretary on the side of the Moscow Patriarchate. The Commissions’ work was interesting and, at times, very difficult. There were moments when our brethren from abroad felt that the very continuation of further work was hardly possible and highly questionable. At such moments, it seems to me, it was Vladyka Innokenty’s quiet, prayerful focus – his extreme restraint of words and immersion in inner prayer – that saved the day. Sometimes, when meeting the following day, we would find it much easier to reach a mutual understanding, allowing us to work out language that could serve as a real basis for unity. There were some infinitely touching moments during the meetings of our Commissions. Most often these happened to follow experiences that had made it seem that there were insurmountable difficulties in finding a solution that would not represent a compromise (a word I dislike), but rather would adequately express the convictions and worldview of the representatives of both the Church in the Fatherland and the Church Abroad. These meetings took place alternately in Russia and somewhere abroad: in France, in the outskirts of Paris; in Germany, in Munich and Cologne; and in New York State, in Nyack. There were accompanied by joint prayer. We gained experience, including experience in human interaction. The initial coolness of alienation, which was felt especially during preparations for the first visit here by a delegation of the Russian Orthodox Church Outside of Russia, gradually gave way to an entirely different relationship. By the end of our joint work, it felt strange to both sides that we could still not serve the Liturgy together. During that time, there were some worrisome moments. I remember the foundation-laying of the Church of the New Martyrs of Russia in Butovo during the first visit to Russia of a large delegation of the Russian Orthodox Church Outside of Russia, which Metropolitan Laurus headed in the spring of 2004. This event entered the delegation’s program at the last moment. Representatives of the Russian Orthodox Church Outside of Russia reminded us that Metropolitan Laurus was not a young man, and that the flight from the United States to Russia would be difficult for him. They asked that the first day of his stay in Russia (which was Saturday) be kept free from engagements. But His Holiness, the late Patriarch Alexy II, who was preparing to serve the Liturgy in Butovo that day, said that an offer should nonetheless be made to Metropolitan Laurus, to see whether he would want to come to Butovo. We replied: “Your Holiness, we have been asked not to disturb him after his flight, since he will need to rest for at least half a day.” His Holiness said: “Yes, but you should say something nonetheless. It strikes me that he would be interested.” And, indeed, both Metropolitan Laurus and his entire delegation came to Butovo. 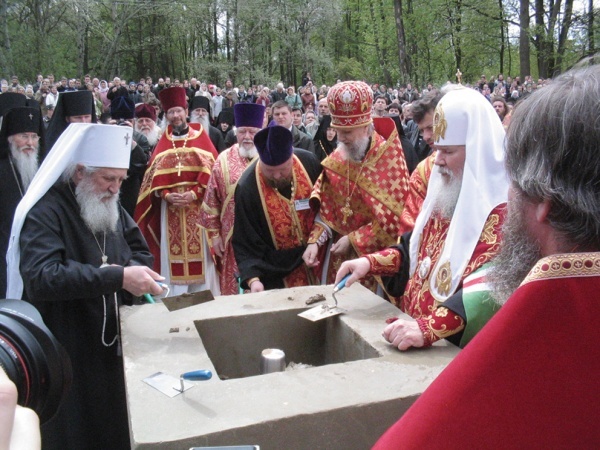 Patriarch Alexy II and Metropolitan Laurus at the foundation-laying of the Church of the New Martyrs of Russia in Butovo. Of course, they were very moved. First, this is a place that has been sanctified by the blood of so many martyrs; second, so many people had gathered for this prayer despite rather unfavorable weather conditions; and third, the Patriarch quite unexpectedly invited Metropolitan Laurus to join him in consecrating the foundation stone of the new church. If we had worked through the protocol for this event ahead of time, this never would have happened, since at that point the Russian Orthodox Church Outside of Russia refrained from any open displays of prayerful communion with us. The secretaries would certainly not have agreed to it. This was a charismatic step taken by the Patriarch, to which Metropolitan Laurus replied with complete willingness. I remember that day very well! 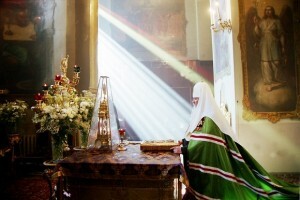 I remember how the delegation of the Russian Orthodox Church Outside of Russia was present at the Patriarchal service on the Ascension in the Greater Church of the Ascension near Nikitsky Gate [in Moscow] – in which, incidentally, His Holiness, Patriarch Tikhon, had once served the Liturgy on this feast day. After that moment, it became especially easy to work with him, who turned out to be capable of such a sincere and difficult action – after all, he spoke these words publically, in the presence of a large number of people. The work of the secretaries always involved a special workload. When the bishops had already gone to eat or rest for the night, the secretaries would normally still be working on the final agreed-upon wording of documents, attempting to establish a mutually acceptable protocol, and so forth. We had many hours of such heartfelt communication, during which we easily found a common language, as if these long decades of division and sometimes very sharp polemics had never been. This was a miracle of God: all enmity suddenly melted away as soon as the time for accomplishing God’s will had arrived. This moment arrived in 2003, when some bishops from abroad came to visit us, still with a great deal of inner caution and a certain detachment. But it was then that they experienced something that radically changed their attitude towards the life experience of the Church in Russia during these past decades. And, of course, something changed in us, too. Our brethren from abroad sometimes painted the following picture of the state of affairs between the Church in Russia and the Church Outside of Russia: Yes, there was an enslaved Church in the Soviet land; its pastors and bishops can, of course, be forgiven for some things, since they lived under very difficult conditions, yet they compromised a great deal and departed from purity. Then there was the free part of the Russian Church. Yes, perhaps it did not endure the same severe deprivations – but, for all that, it preserved intact the purity of Orthodoxy. We tried to convey another vision. There was the Church in Russia and there was the Church beyond the Iron Curtain; but neither here nor abroad did the Orthodox Church live under conditions of complete freedom. Neither here nor abroad did it live, in any case, under the conditions of an Orthodox government, so dear to the heart of the representatives of the Russian Orthodox Church Outside of Russia. Representatives of the Church both here and abroad lived under pressure, since they found themselves on opposing sides of the Cold War. And this political problem, this political standoff, left its mark on church life both in Russia and abroad. Of course, this point of view gradually became mutual, to a certain extent; but from the very outset we agreed that unity of historical views – and, even more so, of political views – was in no way a precondition for our reunion. I think it was also quite important for our brethren from abroad to become acquainted with the actual relationship between church and state in Russia. They agreed that the theoretical description of church-state relations expressed in the foundations of the Social Concept of the Russian Orthodox Church satisfies their most stringent criteria. Various representatives of the Church Abroad became aware at various points that the time had come, based on these words, for it to relinquish its separated position. Those who had come here often had long ago become imbued with the conviction that, at the very least, the political authority in Russia was no more atheistic than that in the United States or any number of other countries where the Russian Orthodox Church Outside of Russia carries out its ministry. But those who had never been to Russia, who were guided by the perception that Sovietdom was not a successor of historical Russia to any degree, continued to be guided largely by such views. This was particularly characteristic of those parts of the world furthest from Russia. In South America and Australia there were many who did not accept the process of reunification at all. A feeling of pastoral responsibility – which should, of course, be particularly characteristic of the hierarchs of the Church – compelled them to move very unhurriedly towards reunification. We in Russia could relate to this with full understanding. May 17, 2007, will of course remain an unforgettable day. Rivers of tears flowed in the packed Cathedral of Christ the Savior, since people were experiencing such happiness. Everything that had divided us was finally behind us. Signing of the Act of Canonical Communion. 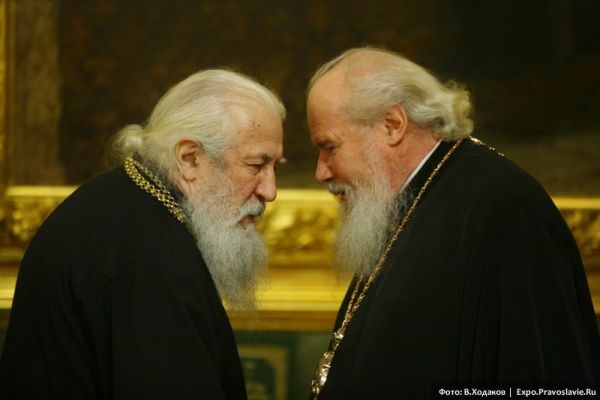 Behind Metropolitan Laurus and Patriarch Alexy II are Fr Alexander Lebedeff and Fr Nikolai Balashov. The large number of people who had come from the furthest corners of Russia abroad, as well as our own compatriots, the most ordinary Moscow parishioners, all stood weeping from joy, since it was clear that something very great and luminous was taking place in the life of the Church. Five years have passed. In the past there had been years when it seemed impossible to imagine that we would ever be fully reconciled with the Russian Orthodox Church Outside of Russia, such was the level of polemics, mutual accusations, and intolerance. Now, it is hard to believe that even five years ago we did not serve the Liturgy together, that we were not fully one Church. This is a tremendous gain. This final act in the process of church renewal, spiritual reunification, and the reconciliation of our people was of tremendous significance. Now, of course, completely different questions have arisen. We are resolving the technical side of our cooperation: how the Russian Orthodox Church Outside of Russia can build relationships with the various bodies of ecclesiastical authority and governance in Russia; with whom one thing or another needs to be coordinated; and from whom best to seek assistance in resolving one question or another. This level of problematics is entirely incomparable to what was back then. How many joint pilgrimages, divine services, clergy conferences, and youth initiatives there have been in these past years is impossible to list. This has now become an integral part of our lives. The changed perception of Russia by those abroad is a separate page, one best reserved for telling by our brethren abroad. But this was very moving for us. During the Soviet era, despite the fact that our perceptions of the reality here did not correspond, we were naturally grateful to the Russian Orthodox Church Outside of Russia for the books they published; for the fact that they sought out means to smuggle them into Russia; for the preservation of the tradition of the Russian Church under the conditions of their life; and for the dignity with which they bore their cross of exile. Now everything has come back to us. The direction of movement has been reversed in many ways. If books were once secretly forwarded from Jordanville to the USSR by various means, now a different question is being faced: how to get tons of Orthodox literature from Russia to the United States inexpensively. This is on quite another level. But the most important thing that has happened over these years is that we have absorbed the experience borne by the Russian emigration. We have learned something in the process of this dialogue and during the ongoing relations with our brethren. They have offered a very significant contribution to our common church life. Bishops, clergy, and laity from abroad are represented at practically every church structure: at our Council of Bishops, at our Local Council, at the Inter-Council Presence of the Russian Orthodox Church, and at various collegial bodies of the Russian Church. We think it is also very important for our brethren scattered throughout the diaspora to have a close relationship with the Church in the Fatherland. It turns out that all these dangers were completely exaggerated. Everything quickly fell into place, and now it is increasingly difficult to imagine how we could have been apart for so long.